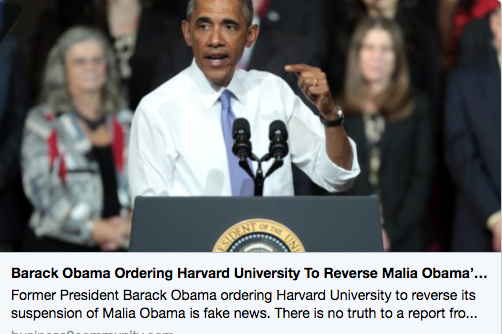 President Obama Orders Harvard to Reverse Malia Obama's Suspension-Fiction! - Truth or Fiction? President Obama Pushes Harvard to Reverse Malia Obama’s Suspension-Fiction! A satirical website is behind false claims that President Obama ordered Harvard to reverse its decision to suspend Malia Obama pending drug charges. The website, Our Land of the Free, first reported on August 12, 2017, that Harvard suspended Malia Obama in light of her “recent drug escapades” because she would be too much of a distraction to other students. According to sources within Harvard, Barack Obama called school president Harmon Finklestein and angrily demanded that his daughter be allowed to attend the university. Of course, he caved. The lifting of Obama’s suspension means she can move into the dorms with other students, perhaps with drugs she obtained elsewhere. A disclaimer that appears in the footer of the website makes no guarantees that its reporting is truthful, adding that the site is “here to entertain you with the kind of whimsical satire conservatives enjoy.” That means reports of Malia Obama suspension, and President Obama demanding that the suspension be reversed, are nonsense. If the rumor sounds familiar, that’s probably because a different website started a false rumor in April 2017 that Malia Obama had been expelled from Harvard due to drug charges. That one was easy to disprove since Malia wasn’t even enrolled at Harvard at the time. Both of these allegations are based on reports and photos that appear to show Malia Obama smoking marijuana at Lollapalooza in 2016. Malia has never been charged for possessing or using drugs. Do Not Accept Friend Request From James Woods on Facebook-Fiction!